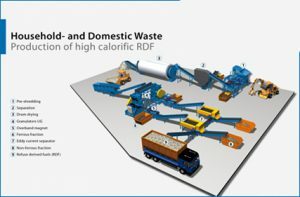 Refuse-derived fuel (RDF) or solid recovered fuel / specified recovered fuel (SRF) is a fuel produced by shredding and dehydrating solid waste (MSW) with a Waste converter technology. RDF consists largely of combustible components of municipal waste such as plastics and biodegradable waste. APPK is the largest producer of solid recovered fuel and refuse derived fuel in the country. We are able to use our network of facilities and ports to supply this material to customers in Thailand and other parts of ASIA. We are experienced in the production, transport and testing of these products and have the ability to tailor these products to individual customer needs. APP supplies specific technologies, processes and equipment for the conversion of waste to energy. This includes equipment for shredding, screening, classification and drying. The outcome is valuable goods, such as high-calorific RDF, as well as non-combustible fractions. MSW and C&I waste contain many different materials that need to be separated mechanically into a high- and a low-calorific fraction. This process involves shredding, screening and classifying of the material. Metals, inerts and organics are removed; light fractions with high-calorific value (e.g. plastics, textile and paper) remain. The RDF fraction could be used in the cement industry, steel furnaces or power stations, substituting coal and oil. The high-quality Universal Rotary Shear UC and Universal Granulator UG are used for primary and secondary shredding. Quickly interchangeable screens allow many different output sizes. The result is a homogeneous refuse derived fuel.